I remember it as if it were yesterday. I had just given birth to my twins (my fourth and fifth children), and a young male nurse came into my hospital room. He asked if I would mind answering a few questions for a study he was conducting. I said sure. One of the questions he asked me was what I fed my children for breakfast every day. I said it varied. "Either pancakes, French toast, scrambled eggs and bacon, oatmeal, cream of wheat, or hot Grape Nuts." "No, I don't mean once in a while," he shot back quickly. "I mean on a regular basis." "Yes, that's exactly what I make for them on a regular basis!" I shot right back, albeit with a weary smile. This exchange made me realize that not everyone enjoys a big breakfast like I do. 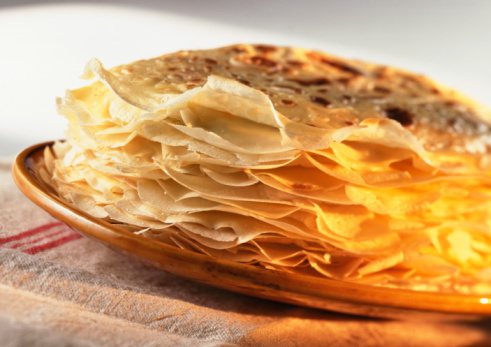 Which takes me to the topic of this post: crêpes. Luscious, delicious, billowy, light-as-air, delectable crêpes. I love them. My husband loves them. My children love them. And now my grandchildren love them. So before I start drooling all over my keyboard, let's continue, please. 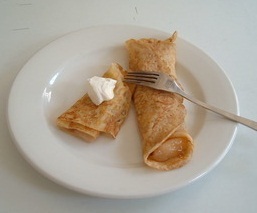 For years, I used to make very plain, sweet crêpes stuffed simply with apple pie filling (straight from a can) and topped with fresh sour cream. No biggie to make, but a real family favorite! Never one to stop exploring, I stumbled across yet another fabulous recipe about a month ago, this time for strawberry crêpes. And I gotta say, these have suddenly become our all-time favorite! 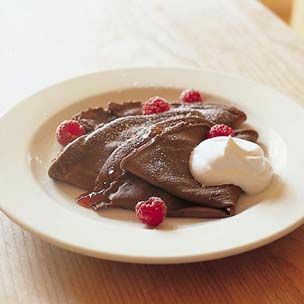 So get out your skillet (or better yet, that fancy-dancy crêpe pan you once bought but never used), and start flipping! 1. 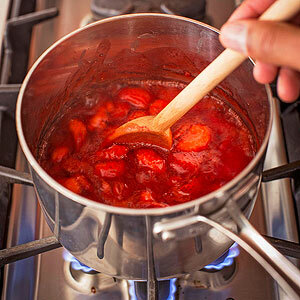 In a medium saucepan, stir the strawberries and sugar together. Let the mixture stand until the fruit's juices release, about 30 minutes. If you're using frozen strawberries, heat them with the sugar over medium heat until they're defrosted, about 2 minutes. 2. In a small bowl, whisk together the cornstarch and lemon juice. Combine them with the strawberry mixture. Simmer the sauce on medium-low until it thickens, about 10 minutes, then set it aside. 3. Place the milk, eggs, flour, sugar, and salt, plus 3 tablespoons of the butter, in a blender and process until smooth, scraping the sides as needed, about 1 minute. 4. Heat the oven to 175 degrees and warm a 10-inch nonstick skillet over medium heat. 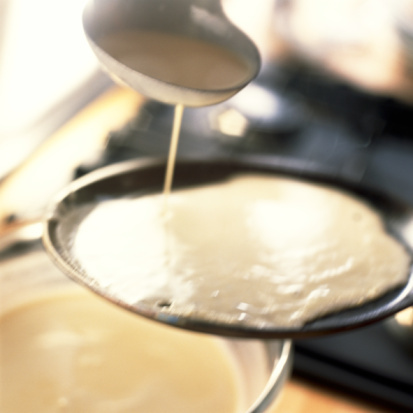 Brush the skillet with some of the remaining butter, then form a crêpe in the pan. 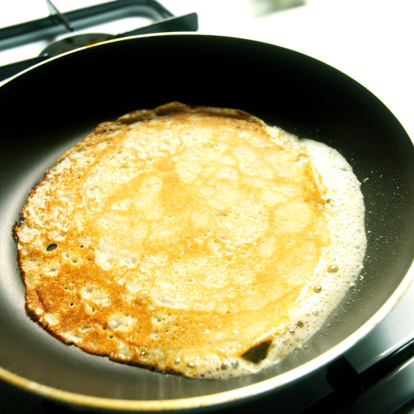 Cook the crêpe until the edges pull away from the skillet and the bottom is golden brown, about 2 minutes. 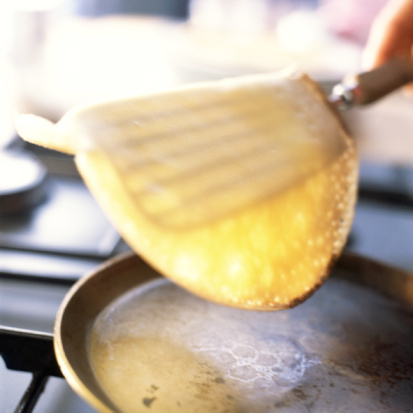 Flip the crêpe with a rubber spatula and continue cooking until the crêpe is lightly browned on the opposite side, about 1 minute more. Transfer the crêpe to a baking sheet and place it in the oven to keep warm. Repeat with the remaining batter. 5. 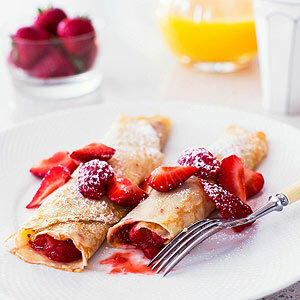 To assemble the crêpes, warm the strawberry filling over low heat, if desired. Add 2 tablespoons of the filling to the center of each crêpe and roll it up. Scatter strawberries over it, then dust it with powdered sugar, if desired. AND NOW, FOR A BONUS! 1. Heat 4 tablespoons of butter in a large saucepan over medium heat. 2. Add 3 cups of diced onions (about 2 large) to the pan, season with 1/2 teaspoon salt, and cook until the onions are soft, about 5 minutes. 3. Add 2 teaspoons of sugar and a pinch of pepper; continue cooking until the onions have browned, about 10 minutes more. 4. 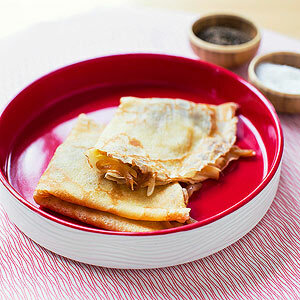 Fill each crêpe with 1 tablespoon of the filling, along with 2 tablespoons of grated Gruyère or Fontina cheese.